Reading this site, you may think that I live the life of a millionaire blogger who sips champagne and eats caviar as I publish my posts. Well I hate to break it to you but I have a job…I actually have two jobs. If you count this site then I have three jobs. I have a day job where I work for “the man” and I have a small freelancing/consulting business on the side. It’s the side business that prompts most of the posts on this site because I actually use or at least try out the apps I write about. 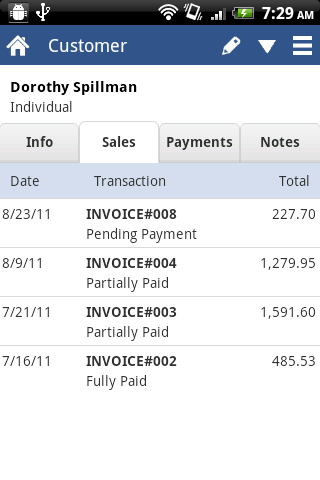 Today I’m looking at MobileBiz Pro which is an invoicing/crm app for Android. Invoicing and CRM functions are vital for a small business and especially for freelancers like myself. MobileBiz Pro aims to let you run your business from your smartphone or tablet. This is a lofty goal but I think they may have accomplished it…or are extremely close. When you first start MobileBiz Pro you set up your company. This includes entering company name, address, contact email, website, slogan and you can even create custom fields. You can also import a company logo. There are many other settings including the ability to create multiple companies. The initial setup actually takes a few minutes but you only have to do this once per company so it really isn’t much of a pain. You then add your customers to MobileBiz Pro. You have two options here you can add them one by one manually or import via CSV. The good thing is that most applications on the market today offer a CSV export. I don’t carry inventory so for the “Items” section I put in the services I offer and the rate at which I charge. So I ended up with several items such as “General Support”, “Custom Development”, “Website Development”,”Web Hosting”, etc. After this initial setup you can then add a new quote, invoice, sales order, or cash sale. You can also record any payments received. The real draw of MobileBiz Pro are the quotes and invoices for me. The default templates are very professional an includes the company logo that you specify in the company setup. You have the option to make changes to the default templates by enabling or disabling sections and entering you own custom text. With a little work you can create your perfect template. Once you have generated an invoice you can view the invoice on screen or email the invoice to the client. 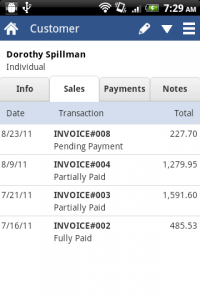 After the client pays you can then change the status of the invoice in MobileBiz Pro. With MobileBiz Pro you can run a variety of reports such as Monthly Tax Report, items sold report, customer profitability report and more. There is also a reminders section which shows you a quick glance of how many expiring quotes, orders to bill, and unpaid invoices you have. You can certainly run and keep track of your business on the go using MobileBiz Pro. But if you are a Quickbooks user and can’t cut the cord, MobileBiz Pro features the ability to export sales transactions to Quickbooks and import data from Quickbooks. This is certainly a complete and feature rich app. The cost is $22 which may seem like a lot at first glance, but considering how many features are included and the fact that it is in active development, it is a great deal. See the detailed feature list below. Do you know of a good employee tracker app? What kind of tracking are you talking about? There are apps that let you keep notes and stats on employees. There are also apps that actually monitor employees via their company issued device. John, that’s a valid concern. You have to decide for yourself based on the type of data that is being entered (specific project details or general job costs) and whether you feel the developer is on the up and up. I believe this is more of a concern with free apps since the developer is generating no income from the sale of the app. An app such as MobileBiz Pro, which costs $22, “should” provide you with more peace of mind. But you could always inquire. So a quick email to the developer asking about whether stored data is encrypted on the server and if they sell the data would be prudent. However, in the end, you have to go with your gut and your instinct. Personally, as a consultant, I’m not too concerned with anyone seeing what invoice data since the majority of my clients are government agencies and the data is subject to FOIA requests anyway. Thanks for the question…it is certainly something people should consider. I agree the users decision to engage these services will depend on how they perceive the importance of their own data. Unfortunately they are making that choice for their clients as well. People may believe the data in these day to day business transactions is of little value to others. Where it can be highly valuable is as a base for activity such as spear phishing or other forms of socialy orinented attack. To a competitor or marketing organisation the advantage of knowing who is trading what with who AND at what price is also obvious. Not particular to this product but I fail to understand the common business model among many mobile apps. When there are clear ongoing costs to provide the app backend but no apparent ongoing revenue stream after the initial purchase, my suspicion is raised. I have the app for mobilebiz and i love it. I run 2 businesses off of the app on my razr.. heres my problem. I was fishing and fell off a boat. PHONE GOT WET. I didnt panic due to when i set it up i backed it up by my sd card. I have a spare razr (identical) to one i used.. i put in my sim card and sd card.. im not finding my mobilebiz. Ive had the app since august 2012 went paperless.. whats ways to recover my info? I’m guessing you weren’t backing up to Dropbox. I would have highly recommended that. For redundancy you always want to have your data in at least two locations. SD cards are known to fail so that becomes your single point of failure. So, do you see any files on your SD card at all? I’m not sure, it looks like it was last updated in May. Have you checked out the support site http://help.imsunny.com/?